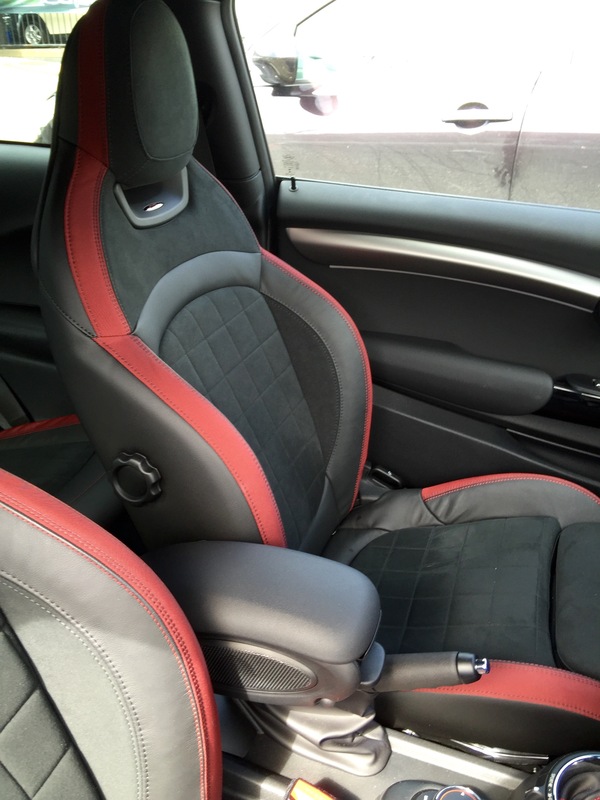 This morning we finally got around to taking a closer look at the new F56 John Cooper Works courtesy of Cotswolds Cheltenham. The car has been reviewed many times over on the net with generally favourable reviews, so I am not going to go down the same full on review. In those terms suffice to say, it is quick fun and very polished – we like it a lot. Here though is a bit of the detail that caught our eye. The one I drove was automatic with chili pack and other extras giving it an on the road price of £34000. For this we got a Heads up display unit, which because of the driving assistance pack gave you three bits of information – your speed, the speed of the road you are on and a graphic rev counter, its position can be adjusted to suit your eye level and instantly I loved this – the information you needed just where you needed to see it. The next thing I noticed were the seats. 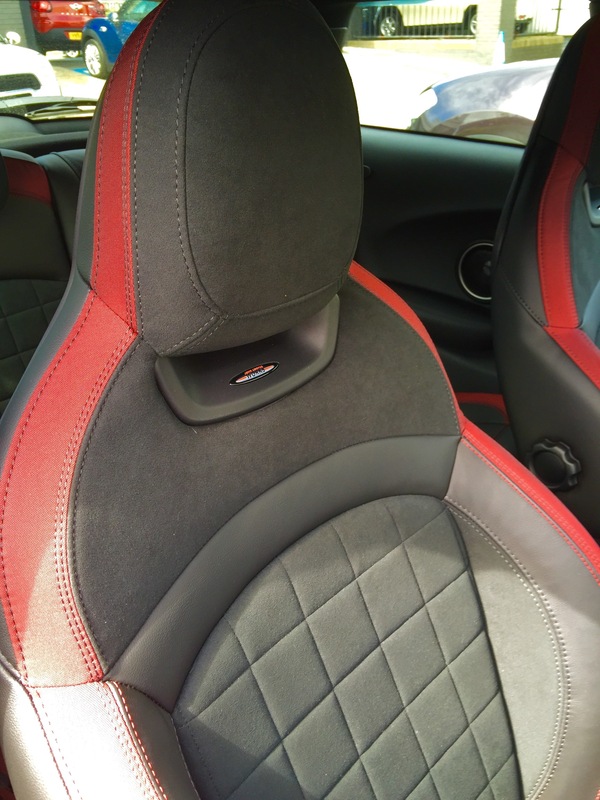 These are I believe the standard works seat, a mixture of fabric, alcantara and leather. They look fabulous and are instantly vey comfortable and very grippy. Yep sold on the seats. 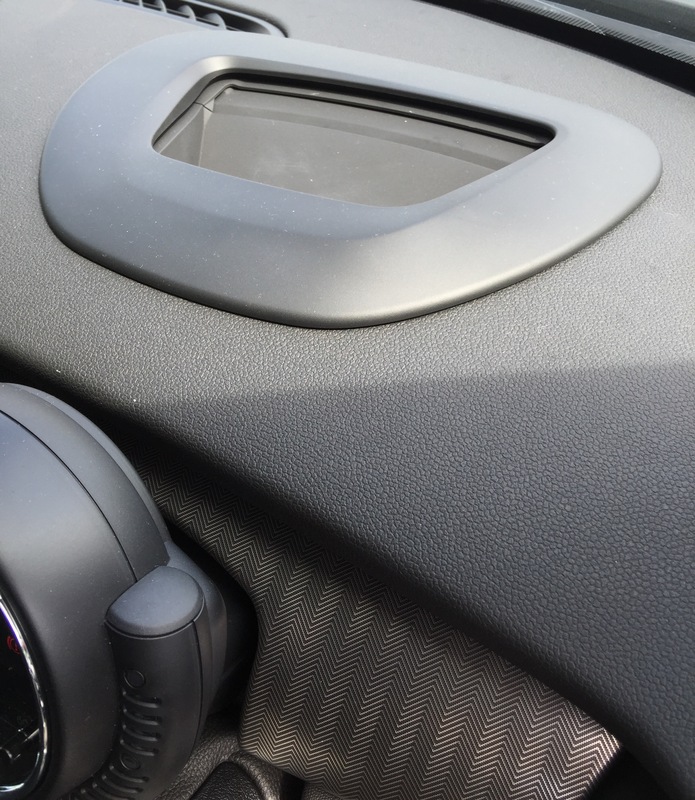 The steering wheel felt good in the hand and looked very professional, it suited the whole car interior which looks premium and polished. Then there is the auto box. Well for me it was awesome. I loved it and would definitely have it in this version. First, the car is quicker as an auto than a manual. Secondly, autos are dull a sports car should be a stick? Well… Not really, you see with a stick you get to drive the car one way i.e by changing gear. With the auto however, you get options. Stick it into drive and let the car do the work. Fun and you tend not to look an arse. Alternatively put into a manual sport mode and change up and down yourself using the paddle shifters on the steering wheel. What a blooming hoot. Trust me it’s great fun. Thirdly the car has the fuel saving stop/start function. My wife, Mrs P still hates this on our Paceman and JCW but matched to this auto box, it is just so smooth and simple. You slow down by braking and come to a stop. The engine switches off, the lights go green you move your foot over to the accelerator and you just go. So so smooth. Spot the bit of red below seeming to stick out of the side of the inner part of the steering wheel. Well actually it is in the middle of the centre console flick switches. It is a shiny red start button. Yep a shiny red start button. Mum… It’s got a shiny red start button can I have one Mum can I? It’s fast too and yet refined if that is how you want it to be. 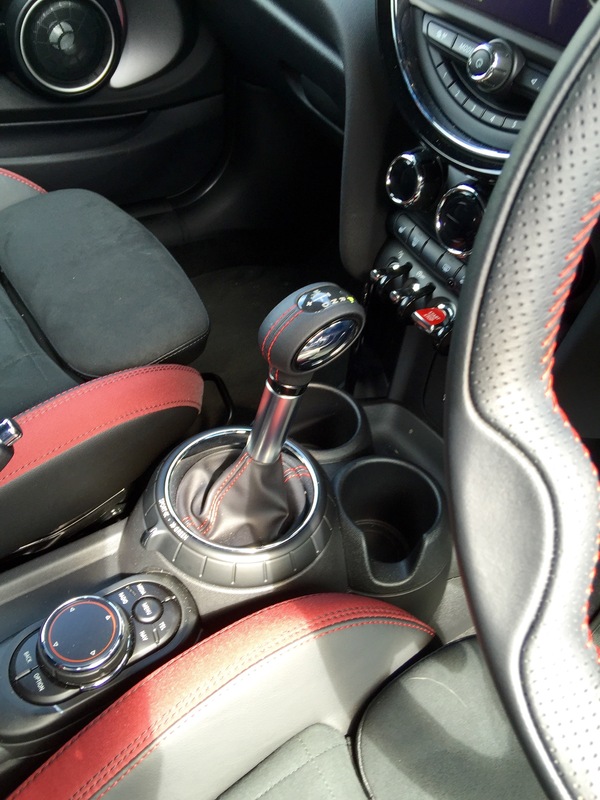 the ride is sporty when required but comfortable and refined (by MINI standards) if you need it to be. So put simply I was impressed. So… Am I getting one? No. Why not, well we love our JCW Coupé so we would want this as well as the Coupé, not instead of and to be honest we haven’t got a spare £34K this week, in fact nor next week either. But if I had, yep I’d have one of these in an instant. For my money there are a number of very special MINI models. The First Generation GP is one and one I still hanker for badly, Don’t know about the second generation GP to be honest. 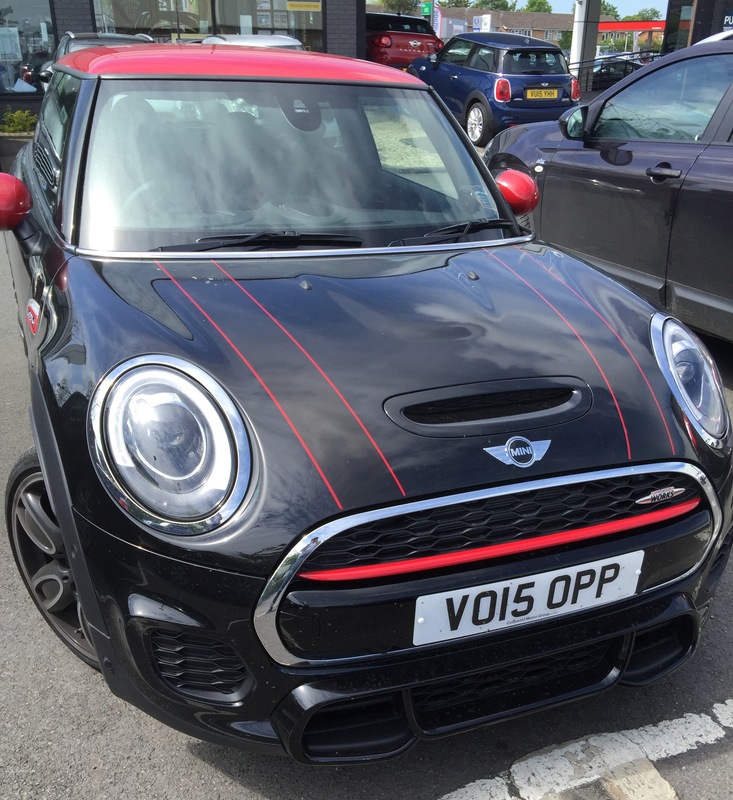 The R58 MINI Coupé JCW is for my money another very special MINI and now I think this one is too. 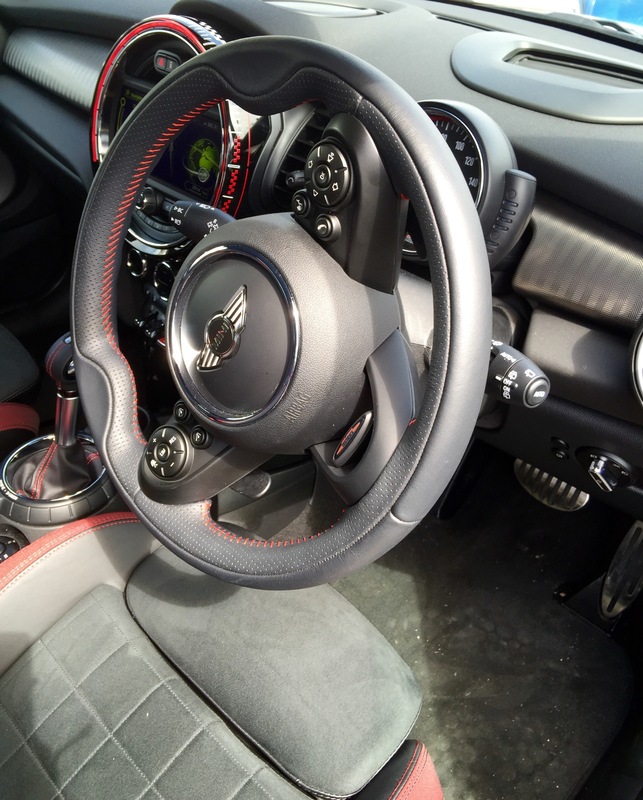 This one is probably the most accomplished all round JCW of the lot but car lovers have no rationality or logic, it’s all about the heart and the seat vibrations that stir the heart so a GP owner or a MINI Coupé JCW owner will probably be just as disgustingly happy with their cars. Conclusion – make no mistake this car is a cracker all the way down to its crackling good exhaust. Categories: Car Blog, Car Of The Week, MINI, Opinion | Tags: JCW, John Cooper Works, MINI | Permalink.